Bishop Rudy V. Carlton, a gift to the body of Christ and a spirit-filled man who has been called and chosen of God to reach this generation as an awesome preacher, teacher, intercessor, and prophet. Recognizing his calling at a young age, Bishop Carlton began preaching the Gospel, April 10, 1988 and has been pastoring since August 6, 1989. He is currently celebrating 30 years of uncompromised preaching, relevant teaching, and relentless worship. In 2002, while following the example of Jesus Christ and being led of the Holy Spirit, Bishop Carlton organized and is the founding visionary of the Jehovah-Jireh Praise & Worship Church Center located in the city of Newark, New Jersey. "JJPWCC" as it is affectionately called, is an emerging community of believers who like their leader are committed to serving the Lord Jesus Christ and following the commission in Mark 16:15, which is to go and preach the gospel to every creature and stand with all baptized believers declaring the Word of God, with high praise and worship to seek and save the lost. In addition to his full-time Ministry responsibilities, Bishop Carlton was elevated to serve as the State Overseer of New Jersey May 2010 for the Full Gospel Baptist Church Fellowship International, under the dynamic leadership of Bishop Paul S. Morton, Apostolic Father and Founder. In October 2011, Bishop was appointed to serve as First Assistant to Bishop Kenneth L. Robinson, the Regional Bishop of the Northeast Central Region. March 2012, Bishop Carlton was affirmed by Bishop Paul S. Morton and the Council of Bishops for Sacred Consecration to the Office of Bishop in the Lord’s Church on Tuesday, June 26, 2012. January 2015, Bishop Carlton was appointed to serves as Coordinator for the Newark West Ward Clergy Alliance under the auspicious of the Honorable Mayor Ras J. Baraka through the newly formed Clergy Affairs and Inter-Faith Alliance Division. 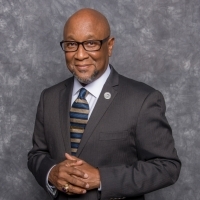 January 2017, Senator Ronald Rice appointed Bishop Carlton to serve as the West Ward Community Liaison for the West Ward Community Coalition Steering Committee. Bishop Carlton exemplifies Christ's love for the church through his sacred marriage to the Elect Lady of God, Linda L. Carlton, which they are the parents of one daughter, two sons, a son-inlaw, two daughters-in-law, thirteen wonderful grandchildren, four great-granddaughters, two great-grandsons, three god-daughters and one god-son. To God Be The Glory For The Wonderful Things He Has Done.